Mazda offers a great line-up of SUVs – so great that you might actually have troubling deciding among them. One way to make it easier to start whittling down your choices is to focus on one characteristic at a time. For many buyers, size is one of the most important considerations when buying an SUV. Most want an SUV that’s big enough to comfortably seat the whole family, but some don’t want something that’s too big or else they feel awkward driving it. The 2018 Mazda CX-3 is the smallest of the three SUVs. It seats five passengers, with two bucket seats up front and a bench seat in the second row. Everyone will be seated comfortably, and they’ll have easy access in and out with all four doors. When the seats in the second row are upright, there is 12.4 cubic feet of cargo space in the back. However, if you fold the seats flat, you’ll get 44.5 cubic feet of cargo space. As you might expect, the 2018 Mazda CX-3 has the best fuel efficiency of the three models, thanks to its smaller size. The 2018 Mazda CX-5 seats only five passengers, like the CX-3, but it offers significantly more room overall. That means that you’ll have more room for cargo, and your passengers will enjoy a much more comfortable ride. When the seats in the second row are upright, the 2018 Mazda CX-5 has a remarkable 34.1 cubic feet of space. Fold the seats down and you’ll give 65.4 cubic feet of space. You would have to fold down the front and rear seats in the Mazda CX-3 to get just 68 percent of the CX-5’s cargo volume. You’ll have space for just about whatever you need in the 2018 Mazda CX-5. If you have a bigger family, you might want to opt for the 2018 Mazda CX-9, which can seat seven people. There are two rows of bucket seats and one bench seat. With that extra seating, you don’t get as much cargo volume in the back as you do with the CX-5. There is only 14.4 cubic feet of space when the seats are up – which is still more than you get with the CX-3. When the seats are down, you get a phenomenal 71.2 cubic feet of space. Do you want an SUV that’s big enough for your whole family plus a lot of cargo? Or do you want something that’s better on fuel efficiency? These are the kinds of questions you’ll need to ask yourself to decide which is the right Mazda SUV for you. 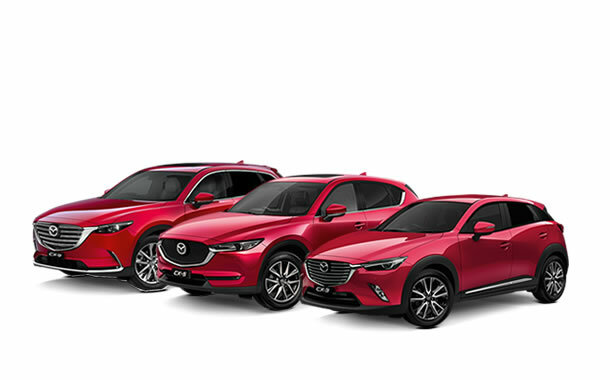 Visit your local Mazda dealership to test drive these three popular models and find out how the space feels when you’re inside.